Cavendish Morton (1874-1939), Photographer, actor and film director. Artist associated with 114 portraits, Sitter associated with 14 portraits. The actor-turned-photographer Cavendish Morton took up photography in the 1890s opening a studio at 60 Primrose Mansions, Battersea Park, London. His portraits of Lady Ottoline were shown at various photographic salons. 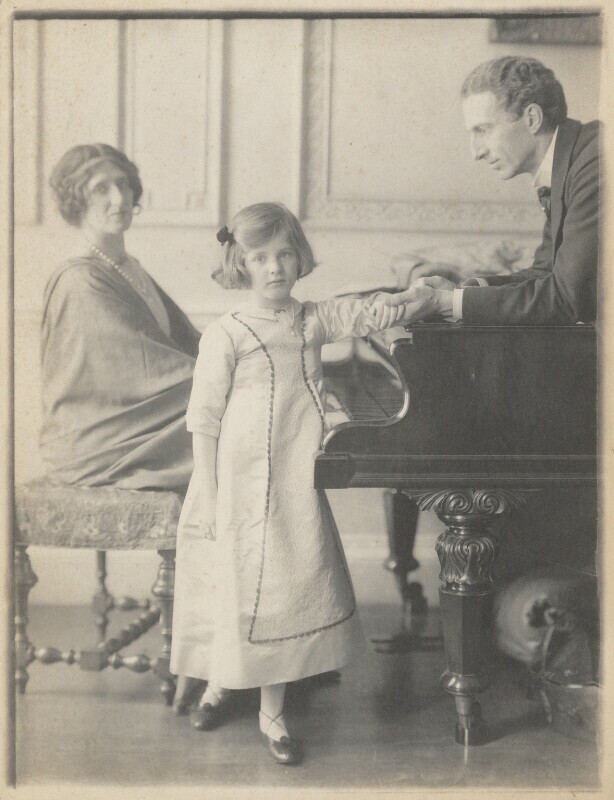 This unique family group study was also used for Philip Morrell's election leaflet, when he stood as prospective Liberal candidate at Burnley in 1910. The portrait was taken at their house at 44 Bedford Square. Asquith's Liberal government introduces the Parliament Act to curb the powers of the House of Lords following the clash between the Commons and Lords over the 1909 People's Budget. The Act removed the Lords' power to veto bills, reduced the length of Parliament from seven to five years, and provided for the payment of MPs. Ernest Rutherford discovers the structure of the atom. The New Zealand born physicist working in Manchester showed with his Nuclear Model that electrons orbited a nucleus composed of protons and neutrons. The discovery paved the way for nuclear physics. The Polish Chemist, Marie Curie, becomes the first woman to win the Nobel Prize for her discovery in 1898 of the radioactive element, Radon. The Mona Lisa is stolen from the Louvre. The masterpiece was missing for two years, during which time suspicion fell on avant-garde poet Guillaume Apollinaire and his friend Pablo Picasso, before Vincenzo Peruggia, an employee of the Louvre, was arrested in Florence.